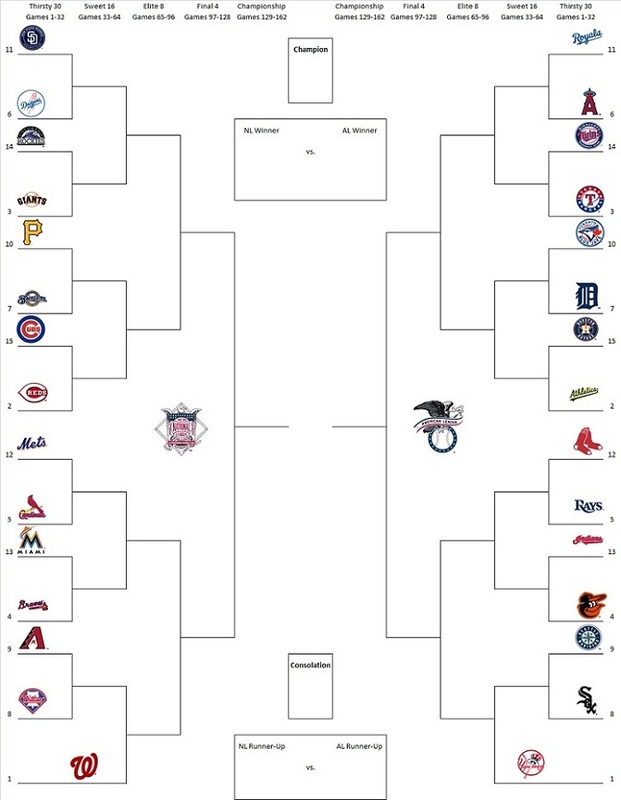 I am excited to announce that the Uncle Doc’s Card Closet 2013 MLB Tournament is going to be held this year! Since the contest was not held last year, some changes are being made to make the seeding and Blogger selection process much more interesting. The tournament seeds are based on the final 2012 regular season records for each of the 30 teams. 2012 Postseason play has no effect (i.e., the Giants are not automatically the #1 seed in the NL). Since Houston is moving to the American League this year, their 2012 NL Central standings are being moved over to the American League (Don’t blame me, blame Selig). Also, if two teams had identical records, head to head matchups were used to determine who had the higher seed. Each round of the tournament is broken into 32 games, except for the final or championship round which will be 34 games. Therefore, Round 1 consists of Games 1 through 32; Round 2 consists of Games 33 through 64; Round 3 consists of Games 65 through 96; Round 4 consists of Games 97 through 128; and Round 5 consists of Games 129 through 162. Whichever team in each two-team matchup has the best record during each round will advance. Records are reset at the beginning of each round and therefore are not cumulative. If both teams in a matchup have the same record when the round is over, then tie breakers are declared. The first tie breaker will be best record based on Head to Head play. If the two teams did not play each other during the round or if they split their series, then the tie breaker will be decided based on the team that had the best run differential over the entire round (i.e., Runs Scored minus Runs Allowed). This contest is open to any and all bloggers. Once I have opened the seeds for selection, the first person to comment and select a team based on the blog’s timestamp will earn the spot. Teams will not be available for claiming until after all 30 of the prizes have been announced. Only one blogger will be allowed per team, and no individual may select more than one team. None. I only request that once you have selected and been approved for a team, or advance a round in the tournament, that you mention the Uncle Doc’s Card Closet 2013 MLB Tournament Contest and/or this blog (www.uncledocscardcloset.com) in a post on your blog. That’s it. This year there will be 30 prizes available, however, only the tournament winner will receive a prize. I have personally selected one card from my collection for each franchise. Prizes will be announced in batches of five between now and when seeds will be available for selecting. Almost every card is a Hall of Famer; there are 1950s Topps cards included; and there are Hall of Famer ROOKIES. Sorry guys, the seeds are not open for selection until after the prizes are named. I will underline and bold that part of the post. I'm confused about one thing (and, not to harsh the buzz of the other commenters, it is not over the fact that you haven't yet opened your selection process yet, correct...? ), are you saying that you are giving each selector a 'franchise' card representing the team they choose, to encourage all thirty teams being chosen? Are the seeds being chosen in groups of five, where the first batch of prizes [(e.g.) Nyjer Morgan, Brien Taylor (East Carteret represent! ), Sean Doolittle (OK... If this happens, I will take the A's...), Pete Rose (Jr.! ), & A-Fraud (TX fathead version...)} are followed by five more appealing choices, then five EVEN more appealing, on and on...? I have selected 30 cards, one for each team. There is one Dodger, one Yankee, etc. The winner of the tourney gets the card for their team. I will release the prizes in batches of 5 over 6 posts. Wow! What a cool vintage contest! When does it start? How do I get signed up?